I had a day trip to Zhou Zhuang, a place comprising rivers and old style houses, on a weekday. 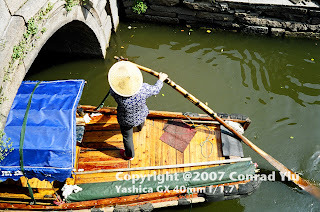 It is described as one of the attractions for the rural areas near down town of Shanghai (within 2 hours by bus). Turned out, a very disappointing place, where I won't come again. Crowed with tourists, lack of attractive scene nor architecture (personal thought). Think twice before you go. 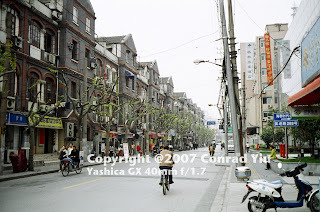 I prefer hanging out around the down town of Shanghai. You might find more appealing places and architecture to use up your rolls.